We're delighted that our first organic garlic crop has just been successfully harvested, seeing a good return on the planting. Our organic garlic will be available for food lovers to buy in The Great House at Kilver Court Designer Village in Shepton Mallet for 40p a bulb from September. Guy Day, the new Executive Chef at our sister company Kilver Court Designer Village, has been busy developing lots of exciting dishes incorporating fresh organic produce from the farm. The latest harvest recently landed in the restaurant kitchen and Guy decided to experiment with flavour combinations using Sharpham Park organic garlic as the key ingredient; “There are so many ways you can use garlic but I wanted to create something that not only tastes delicious but looks fantastic too”. 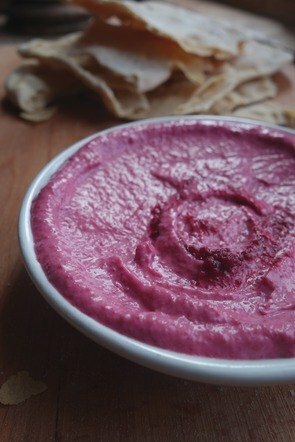 Guy’s roasted garlic and beetroot dip is best paired with a slice of spelt bread or added to a pearled spelt risotto. Blended together, these ingredients form a healthy recipe; beetroot is packed with iron, antioxidants and vitamins, and garlic transforms it into a top immune boosting dip. 1. Place the beets in a large pot of boiling salted water. Reduce the heat and cook for 15 to 20 minutes until beets are tender. Leave in the water to cool so to not lose their colour. 2. Blanch the garlic: place the cloves in a pot of cold water with 1 tsp of salt, bring to the boil. Once the water boils, strain garlic and add it back to the pot. Cover with cold water and repeat the previous steps six times. 3. Remove garlic and place on a tray, drizzle some oil and butter and add a dash of salt, sugar and thyme on top. 4. Cover with foil and bake for 10-15 mins until lightly coloured. 5.Once cool, peel beetroot and cut off ends. Base in blender with 2/3 of garlic until pureed. 6. Add sour cream and mayonnaise and season with salt and pepper. 7. Serve in a bowl and sprinkle the remainder of the garlic on top.